Signal processing and interpretation, automated analysis of medical images, pattern recognition, and artificial intelligence techniques. Benoit M. Dawant received the M.S.E.E. degree from the University of Louvain, Leuven, Belgium, in 1983, and the Ph.D. degree from the University of Houston, Houston, TX, in 1988. Since 1988, he has been with the Faculty of the Electrical Engineering and Computer Science Department, Vanderbilt University, Nashville, TN, where he is currently a Professor. His main research interests include medical image processing and analysis. Current projects include the development of algorithms and systems to assist in the placement of deep brain stimulators used for the treatment of Parkinson’s disease and other movement disorders, the placement of cochlear implants used to treat hearing disorders, or the creation of radiation therapy plans for the treatment of cancer. 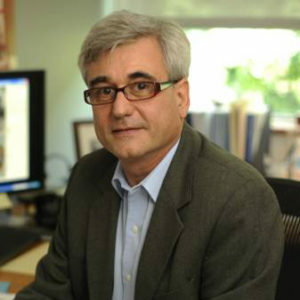 The work of his group in the area of DBS has been featured by the National Institute of Biomedical Imaging and Bioengineering (NIBIB) on its e-advances web site (http://www.nibib.nih.gov/HealthEdu/eAdvances/31Aug10). Dawant talks about the labs main focus; to develop algorithms, methods, and techniques to extract information from medical images and make that information available to clinicians to assist them in a number of clinical procedures. The ultimate goal is to have positive outcomes on those procedures.